Hello, folks!Security is an important subject and we are trying to include some protection features into our software. Perhaps you have already heardabout HotlinkBlocker and its reincarnation in Helicon Ape — mod_hotlink module.Cool stuff, but we want to give you more. Helicon Ape 1.2.0.20 brings us mod_evasive, the module destined to protect your web-server from DoS and brute-force attacks. Sounds vague, so we’ll provide a little explanation. In the security circles, familiar acronym «DoS» has nothing to do with well-known operating system. It stands for «Denial-Of-Service» and means an attempt to make a computer resource unavailable to its intended users.Also there is another term – «Distributed Denial-Of-Service attack» (DDoS attack). As opposed to DoS, brute-force attack is commonly aimed at getting some access to a protected resource. For example, a computer hacker is trying a large number of possible passwords to crack a needed user account. In fact, lots of users use very simple passwords and hackers are gathering these passwords in special databases to use during brute-force attack. The module was originally written for Apache and we tried to support its syntax to the maximum extent. Moreover, Ape implementation has a potential for further developmentand we are waiting for your suggestions and criticism. Now we are ready to write mod_evasive configuration. The module directives should be written only inside httpd.conf file (per VirtualHost configuration is also supported). DOSPageInterval — Sets a minimum accessible interval between two requests to a page from the same IP. DOSSiteInterval — Sets a minimum accessible interval between two requests to a site from the same IP. DOSBlockingPeriod — How much time bad IP should be blocked. Now we need to explain you mod_evasive logic. The module counts how many «too short» requests are made from same IP to various URLs and to the whole site. «Too short» means less than accessible interval set by DOSPageInterval and DOSSiteInterval directives. When an IP exceeds the count threshold, it will be blocked during a period set by DOSBlockingPerioddirective. DOSPageInterval, DOSSiteInterval and DOSBlockingPeriod values should be specified in seconds (real numbers are also supported to define more accurate intervals. Note! You should carefully set mod_evasive configuration according to your server load! In case of incorrect configuration, legal users might be blocked.Here is an example of a minimal possible mod_evasive configuration. Please don’t use it without testing! This configuration is enough to start blocking attackers. On the next step we will tell you about the blocking behavior. 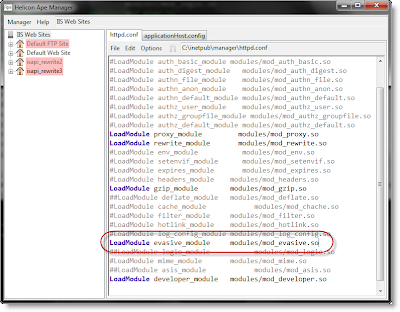 According to original mod_evasive behaviour, the module sends 403 (Forbidden) code. Actually the blocked responseis faster than the common one, because Ape stops request at this point and IIS processes only BeginRequest and EndRequest notification event. In addition we’ve invented DOSCloseSocket directive (not supported in Apache) which is disabled by default. If you enable this directive, mod_evasive will send 403 code and close connection socket. It means an attacker should create a new connection and it’s pretty good for you as long as this process takes some time. There is one more useful feature in mod_evasive. It is DOSSystemCommand directive which gives you a chance to communicate with OS through command execution. You should be careful with this feature because it might beinsecure and might cause NTFS permissions issue.So, a command delivered to mod_evasive through DOSSystemCommand directive, will execute each time the module decides that an IP is bad. So, the command will be executed not for all 403 responses, but only for those given in response to malicious requests. VBCRLF & "You must be running Windows 2000 for this script to work." /?|-? will display this message." DOSSystemCommand "cscript ra.vbs user password command"
name=\"mod_evasive %s blocking\" dir=in protocol=TCP localport=80remoteip=%s action=block\""
Please notice that %s variable contains a string representation of blocking IP. This entry was posted in Helicon Ape and tagged CodeProject mod_evasive security. Bookmark the permalink. Can you have something for Windows Server 2003? This module should work just fine on 2003 as well. Can you teach me how to use the script. Hi, could you please put your question to our forum (http://www.helicontech.com/forum/forum_topics-FID-11.htm) and we'll give you an explicit answer.